Yesterday I delivered Kathy’s Christmas present, this 28″ NYC pillow I made for her. I think it was a hit, and Adam even told me this was one of his favorite things I’ve ever made. Bonus! I wish I’d remembered to take some pictures of her with it, though. And in natural daylight instead of at night in my kitchen. Most of the squares came in a charm pack of NYC fabric that I bought from The City Quilter for this project. 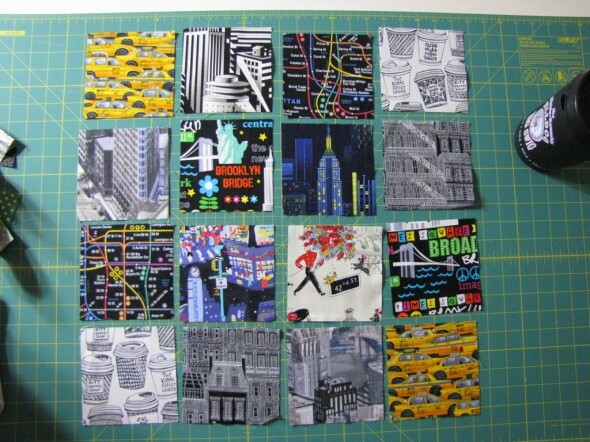 The only fabric I cut into 5″ squares for this is the black fabric with white buildings drawn on (bottom row, 2nd from left). 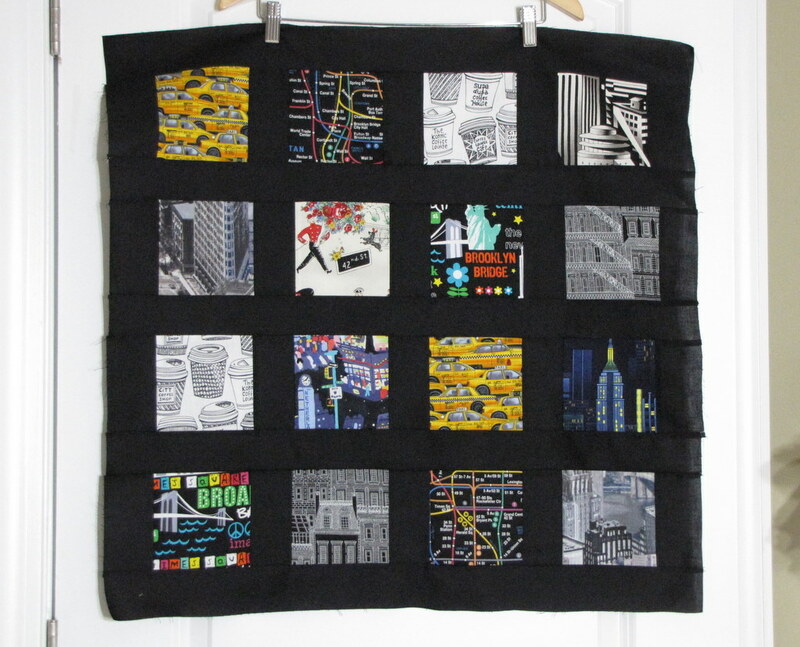 I used 2.5″ strips of black fabric for the sashing to frame each square. It took me forever to decide on the layout. Then I pinned it to some batting and stippled all over it. 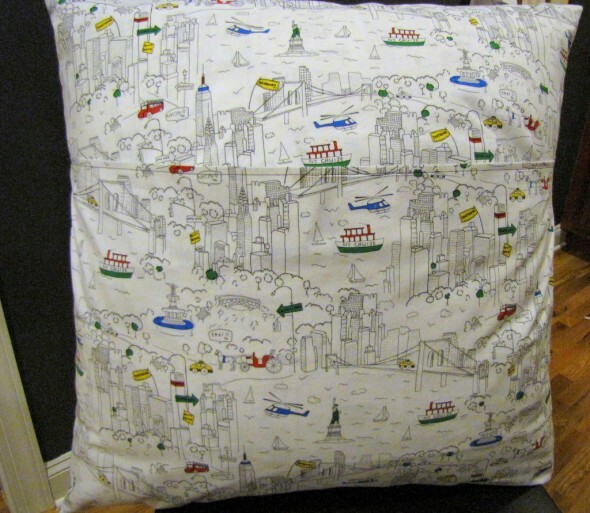 I think the final size of the pillow case was closer to 26″, but I like my pillows super-stuffed. So I thought that was perfect for the 28″ pillow form I put in it. I made an envelope back out of another NYC print from my stash. I’ve had this forever, just waiting for the right project to cut into it. 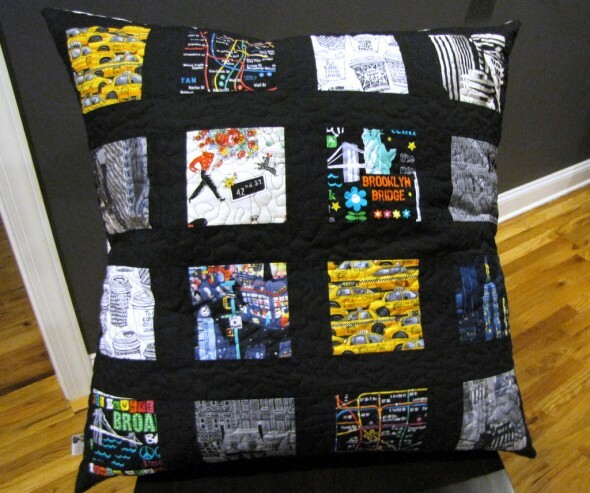 I don’t even think City Quilter carries this one anymore. But I love it, and I’m glad to see it go to a good home.